Deserts are renowned for being dry, extremely hot and often remote. As such, most people imagine them to be dull, boring and dangerous places. Granted, deserts can be extremely dangerous. However, they aren’t dull and boring at all. In fact, deserts can be extremely fascinating. 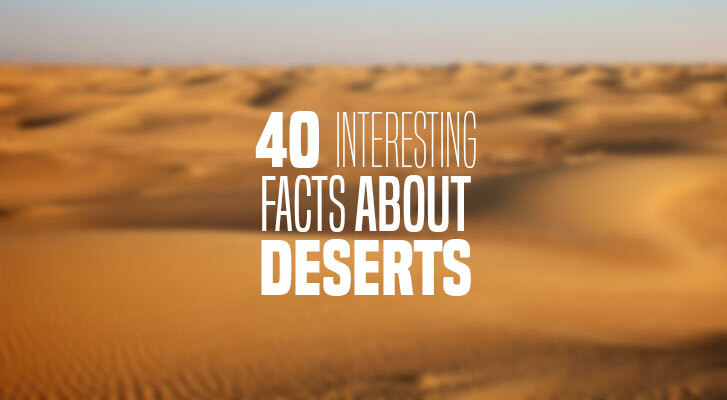 Here is a selection of the 40 most interesting facts about the desert. 1. A desert is defined as any place on earth which receives extremely low precipitation (i.e. rain or snowfall). A desert typically receives less than 40cm (16 inches) of precipitation per year. 2. There are two types of desert i.e. hot deserts and cold deserts. The cold deserts are found in the polar regions of the earth. They are the Arctic and Antarctic deserts. The cold deserts are also referred to as polar deserts. 3. Around one-third of the earth’s surface is covered in deserts. 4. The overall size of deserts is increasing. Around 46,000 square miles of land are turned into desert every year. This is as a result of climate change and human activities like clearing forests. 5. The largest desert in the world is the Antarctic Desert. It covers an area of 13.8 square kilometers around the North Pole. The second-largest is the Arctic Desert which covers an area of 12.7 square kilometers around the North Pole. 6. The largest hot desert in the world is the Sahara. It covers an area of 9.4 square kilometers and spans 12 North African countries. 7. The smallest desert in the world is the Carcross Desert. Located in Yukon, Canada, this desert is just 1 square mile (640km) in size. 8. The Sahara is considered the hottest place on earth. Average temperatures range between 40 and 47°C. The highest temperature ever recorded in the Sahara was 58°C in 1913. It is the highest atmospheric temperature ever recorded on earth. 9. The driest desert in the world is the Atacama Desert in Chile. Parts of this desert have received no rainfall since records began. Scientists believe that parts of the Atacama have been in extreme desertification for over 40 million years. 10. The coldest desert in the world is the Antarctic desert. The average winter temperature is -49°C. However, in 2010, a temperature of -94.7°C was recorded, and in 2013, a temperature of -92.9°C. These are the two lowest atmospheric temperatures ever recorded anywhere on earth. 11. Although it is one of the driest places on earth (with less than 20mm of rain per year), the Antarctic Desert contains about 90% of the earth’s fresh water. This water is found in Antarctica’s permanently frozen ice sheet. 12. Despite seeming deserted, deserts often have an incredibly diverse ecosystem. In fact, the only other places on earth with more diverse ecosystems than deserts are rain forests. Deserts are often home to a variety of plants, mammals, reptiles and insects. 13. The first dinosaur eggs were discovered in Gobi Desert in 1923. Gobi Desert is located in parts of northwestern China and southern Mongolia. It is the fifth-largest desert in the world. It was created in the shadow of the Himalayas as the tall mountains prevented rain from reaching Gobi. 14. The Gobi Desert is the fastest growing desert in the world. It is expanding by more than 1,300 square miles. Its expansion is attributed to extreme cultivation practices and climate change. 15. Despite being the driest place on earth, the Atacama Desert supports around 1 million inhabitants. These inhabitants mostly survive by tapping water from aquifers (underground streams) for growing crops. They also raise animals like llamas and alpacas. 16. The Namib Desert, located in Namibia – Southern Africa is considered the oldest desert in the world. It is considered to be between 55 and 80 million years old. Comparatively, the Sahara – which is between 2 and 3 million years old – is much younger. 17. The Namib Desert has the tallest sand dunes in the world. Some of these sand dunes are up to 300 meters high. Besides being high, the sand dunes are also extremely spectacular and are a popular attraction for nature lovers. 18. The Aralkum Desert in Uzbekistan is currently the world’s youngest desert. Created entirely due to man-made disturbances, this desert (which is about 45,000 square kilometers in size) is less than 50 years old. 19. Scientific evidence shows that the Sahara is actually shrinking. Experts who have studied the desert for over 30 years have discovered that the edges of the desert are becoming greener. This shrinking is attributed to climate change. 20. The Mojave Desert is the driest desert in the United States. It has an annual rainfall of around 5 inches. It is also home to the Death Valley – considered the hottest, driest and lowest place in North America. 21. The Aralkum Desert is the most toxic desert in the world. This is because it has large deposits of pesticides, fertilizers, chemicals and run-off from farms and cities in five Central Asian countries and Afghanistan. 22. One of the most resilient desert animals is the tortoise. The desert tortoise is found in the Mojave Desert. An adult tortoise can tolerate temperatures in excess of 50°C and can survive without water for up to one year. 23. The world record for crossing the Sahara by bicycle was set by Reza Parkravan – a 36 year-old London market security analyst – in 2011. He rode for 1,084 miles in 13 days, 5 hours, 50 minutes and 14 seconds. He started from Algeria, rode through Niger and Chad; and ended his journey in Sudan. 24. The country with the fastest rate of desertification is China. Almost 1000 square miles of Chinese land turns into deserts each year. The rate is highest in areas surrounding the Gobi desert. 25. The Bushmen in the Kalahari desert (in Namibia) have adapted to the extreme lack of water. They use a specific root called “Bi!” which as a source of hydration. The Bi (also known as the milk root) is a bulb which has a milkfish liquid. People drink the liquid to keep themselves hydrated in the extreme temperatures. 26. The most fierce snake in the desert is the inland taipan. Found in the deserts of Australia, it is considered by some scientists to be the most venomous snake in the world. A single bite from a taipan can inject enough venom to kill 80 (yes, eighty) men. This is almost 20 times more potent than venom from the King Cobra. 27. The most dangerous desert inset is the Killer Bee. Also known as Africanized Honey Bees, these insects move in swarms consisting of up to 900,000 bees. They are also quite temperamental – and have been known to sting humans to death. When attacked by Killer Bees, the best option is to cover the face and run into the nearest shelter. 28. The largest desert bird is the Ostrich. Found in the deserts of Africa, Australia and Arabia, the ostrich is also the most dangerous desert bird. This may sound surprising given that ostriches are generally known to be gentle and shy. However, they can get aggressive especially when their eggs or young ones are threatened. Ostriches have a powerful kick. They also have 30 cm long claws which are thick and strong. These claws can easy disembowel an animal. 29. The most ravenous predator in the desert is the African wild dog. Found in the deserts of Africa, these animals hunt in packs of up to 40 animals. They mostly take down ostriches, foxes, wildebeest, warthogs, and antelopes. Although they rarely attack humans, they have been known to do so especially when extremely hungry. Surviving an African wild dog attack is almost impossible – they are swift, vicious and ravenous. 30. The Arctic Desert has around 700 plant and 120 animal species. The plants include lichens, grasses and shrubs. The animals include mammals, birds, reptiles and even fishes. For instance, some of the mammals found in the Arctic Desert include arctic foxes, polar bears, wolves, squirrels, arctic hares, voles, lemmings, caribou, seals, walruses and whales. 32. The Sidewinder is one of the most unique snakes in the desert. Found mostly in the Sahara desert, this horned viper is renowned for its legendary sideways movements. This movement is an adaptation to move fast over the desert sand. 33. The Scarab Beetle is perhaps the most unusual insect in the desert. Known to most people by its less-glamorous name, the dung beetle, this insect lives almost exclusively on animal waste. It is best known for rolling animal waste into round balls. These balls are what it feeds on. In some cases, they simply burrow a hole into a pile of dung and make it their home. This means that whenever they feel hungry, they simply munch away. 34. The deathstalker is the most venomous scorpion species in the world. This yellowish, translucent scorpion (which is also known as the Naqab desert scorpion and Palestinian Yellow scorpion) is found in the deserts of Naqab, Arabia, Sahara and numerous US deserts. The deathstalker almost exclusively hunts at night. Its sting is extremely painful, and the venom is toxic enough to kill a child, or elderly person. 35. The most extreme ultramarathon on earth is annually carried out in the Sahara Desert. It is called the Marathon des Sables and has been christened “The Toughest Footrace on Earth.” It involves a 156 kilometer trek through the Sahara, over a period of six days. 36. Antarctica is the only continent in the world which is entirely covered by a desert. The Antarctic Desert covers the entire continent. 37. The most deadly desert spider is the Australian redback spider. Located in the Australian desert, the redback is responsible for almost 10,000 bites per year. The bites cause swellings, nausea and vomiting. Most are treated and aren’t fatal. However if left untreated, a redback spider bite can be fatal. 38. The most feared desert spider currently is the Camel Spider (aka the Egyptian Giant Solpugid). This big, hairy spider has had nightmarish tales circulated about it. Over the last few years, there have been stories circulating around the web of the spider eating up camel stomachs and sleeping soldiers. However, these are mere exaggerations. The Camel Spider preys on small insects. Its bite isn’t lethal to humans. 39. The Antarctic desert is considered the highest desert in the world. This is because its elevation outstrips that of any other desert. 40. Although the Sahara Desert is the hottest place on earth, it has ever received a snowfall. On February 18th, 1979, snow actually fell in the Sahara. The snowfall lasted for about 30 minutes, and the snow took a couple of hours to melt off. Scientists are still puzzled as to the phenomenon which led to the snowfall. 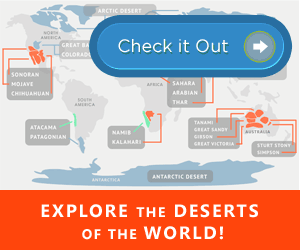 The area of desert is listed wrong. For example: Sahara is listed as 9.4 square kms. It is 9.4 million square kms. Can you please correct it? Thank you Rajhava! This has been updated to reflect the correct notation!